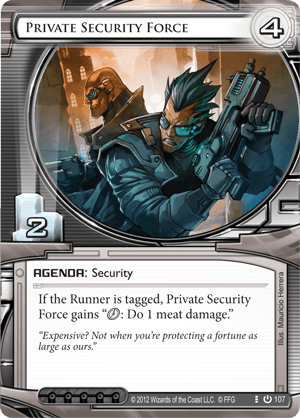 If the Runner is tagged, Private Security Force gains: "click: Do 1 meat damage." "Expensive? Not when you're protecting a fortune as large as ours." "Crapdamnit Bill, when do I get to kill a fool??" "Hate to break it to ya kid, but probably never. You want action you shoulda joined one of those Single-purpose counteraction groups, volunteered for some incandescent structural alteration or specialised in non-medicinal trephining. We're just a security force." If you're forced to play this (when using the Core Set, for example) and you're not focusing on flatlining the runner, this will probably seem a hard way to score 2 points. I certainly thought so, until I realised that whenever I scored this the runner would pay to remove every tag, even if they knew I had nothing else in hand to punish them. It's enough of a deterrent to make them pay that 4 after a Siphon, that extra kick from a Snare(!) and running through trace ice. It will shave small but frequent sums off the runner's account, keeping them from getting (too) far ahead and giving you the finger while the whole world watches. In the end, pretty much everyone clears tags anyway. This just glares and threatens to aggressively prod those who think they don't have to. A careless 4th click run into a Snare(!) you can punish (probably fatally) the following turn. Spending 8 on 2x Biotic Labor to hit them for 5 with a surprise robot army? Nothing else really comes to mind. Early on when there weren’t a lot of choices for agendas this was seen, sometimes. Even then it wasn’t regarded as a great card - four for twos are usually just as difficult to score as a five for three, and don’t provide as much of a jump in points. They also clog up RD and add more cards that can be stolen by a runner to the deck. PSF at least has a really great ability. PSF Lock it was called, where the runner gets tagged and the corp just spends three clicks a turn doing three meat damage. Not only would the runner have to clear the tag but also draw back up as quickly as possible - throwing tempo very quickly in the corps favor. Tagstorm may see this agenda return, but compared to the other four for two neutral agenda, NAPD Contract it is a bit lackluster - that four credit cost to steal is a much more guaranteed tempo hit for the runner than maybe getting a PSF Lock - PSF is a bit lackluster, even though if scored it can be a real big threat to any runner who sees a tag. If you manage to score Private Security Force and The Cleaners you could tag your opponent and do 6 meat damage for 3! Or you could. you know, score your last two Agenda points and win the game, instead of screwing around. This is pretty likely, since if they can't stop you from scoring a 5/3 and a 4/2, then you could easily score Project Atlas (or just 2 Hostile Takeovers). Now you could potentially play this as NBN, but who would want to replace AstroScript Pilot Program, Project Beale or any other card out of NBNs beautiful delicious agenda suite with useless garbage like this card?